Quite the talking point in the garden. This Asarum has the most exotic flowers, chocolate brown and white, reminiscent of a Panda! Most Asarums hide their insignificant flowers under their leathery polished leaves, but this one is not so shy. A plant for the experienced gardener methinks. Categories: A-D, Featured Plants, Plants A-Z, Plants by Season, Plants In Situ, Spring, Summer, The Secret Garden, The Woodland Walk. The leaves on this Asarum are very large and leathery, exotically variegated in shades of emerald, blue and grey.However, this is quite an unusual Asarum in that it is grown as much for its flowers as its leaves. 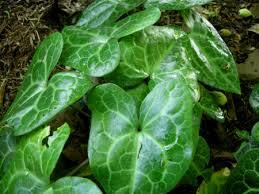 The flowers of Asarum maximum are (as the name implies) – large. They are violet-black, with a large and prominent white eye suggestive of the Giant Panda. Very handsome indeed.Grown best in a well-drained, humus-rich soil, in half shade, but it will take more sun when well established. Remove leaves (if present) after transplanting to reduce the strain on the comparatively small root system.